It's light, strong and natural. It's Bamboo! As a designer, technician and artist I have always been enchanted by geodesic domes. As technical director for the Absoluut architectuur event in the Skyhall zaventem 2005 I had the chance to build my first geodesic dome for Absoluut Wodka as an igloo substitute. In 2006 I studied the traditional building styles as research for the eternity 4 elements architectural contest and expeditions, I was initiator of this project and was part of the jury. My visit to the exhibition Vegetal city from Luc Schuiten proved to be a new impuls to start thinking again about geodetic domes this time with respect to the environment. My fascination for bamboo use in architecture was reignited. The visit of a good friend finaly started the action process. We are designing and building dome shaped tents & habitats which are modular and sizable, with respect to the Cradle to Cradle principle. The used materials are ecologicaly friendly. For the tents we are using organic canvas as cover. After the prototype phase a functionality orientated floor will be part of the design. Our experience in organizing and planning events and exhibitions will help us to find and provide future client oriented solutions. The possibilities for disaster relief, ecological living, high end events and entertainment are multiple. 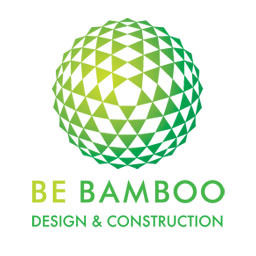 Bamboo is the main structural element for the BeBamboo dome. Bamboo can be used as modern building material. Bamboo struts, when the ends are treated correctly, have strenghts which can be compared with steel pipes. This has been proved by tests conducted by the bamboo structural engineering division from Aachen university. The bamboo plant is a big C0² absorber and has a fast growth rate. A plantation of bamboo can offer bamboo ready for building after 5 years. The necessary bamboo is now imported from Asia and Latin America. In the near future Bebamboo will examine the possibilties for using bamboo from plantations in Europe. Bebamboo is designing and making its products according the C2C principle. In 2002 William MC Donough and Michael Braungart have introduced the cradle to cradle principle to the world by writing a book and they have been giving lectures, designing and building C2C all over the world ever since. They have proven that C2C projects can be economically viable, ethically justifiable end ecologicaly responsable. Instead of downcycling we can choose for real upcycling. In short this means that a product when reaching the end of it?s lifespan, we should be able to separate the different components and reintroduce them straight into the technological or biological cycles without endangering or contaminating the ecosphere. There is no waste. The Bebamboo geodesic dome has a modular nature. Structural pieces which are damaged or worn out can be easily replaced. The canvas covers, which come in 3 parts, top, middle and bottom rings, have the same advantage of easy replacement. Weather Adaptability (summer vs winter conditions) and client oriented adaptability (open bottom ring, prints, projections) are easy feasible. Different sized domes can be combined to form clusters which in turn can be interconnected with tunnels if needed. Geodesic domes maximize volume while minimizing surface area and provide structural integrity with a minimum of energy and material. They are perfectly stable and inert when anchored down, energy efficient as an architectural structure, retaining heat while minimizing solar heat load and minimizes drag and distributes wind and snow loads. In construction this means that we need less material to obtain the same volume compared to traditional building methods (30%). The results of this study will provide us with the correct course for economic viability. The experience of being or living in a round habitat gives one a good feeling. The round curves attract naturally. The use of natural materials is being appreciated for its esthetical ambiance. The lack of chemical emissions is beneficial for both body and mind. Geodesic domes are very strong. Some of the largest buildings in the world are domes because of their self supporting nature. Domes are naturally hurricane resistant and bamboo constructions are earthquakeproof. High winds can pass smoothly over a dome because it has no corners and flat surfaces to cause turbulence, high pressure air presses the dome down towards the ground. we also would like to thank all companies and people we work together with.